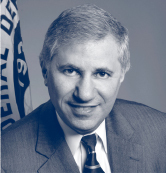 I am pleased to present the Federal Deposit Insurance Corporation's (FDIC) Annual 2005 Performance and Accountability Report (Annual Report), a comprehensive overview of the FDIC's programs and performance for the calendar year. The FDIC has been and will continue to be exceedingly well served by the professionalism and dedication of its staff. I am honored to have the opportunity to report the important results and accomplishments of their activities in 2005. I assumed my duties as Acting Chairman on November 15, 2005, upon the resignation of Chairman Donald Powell, who, at President Bush's request, departed the FDIC to take charge of coordinating the federal government's efforts towards rebuilding of the Gulf Coast following the unprecedented natural disasters of Hurricanes Katrina and Rita. For the FDIC, the year will be remembered for these storms and their effect on Gulf Coast banks. Our top priority was ensuring stability and public confidence in the region's banking system. We worked around the clock with our fellow banking regulators, financial institutions and the public so that consumers and businesses could quickly regain access to needed financial services. We actively monitored the operational condition of financial institutions in the region until our concerns were mitigated. And we joined other regulators in encouraging banks to work with borrowers affected by the hurricanes. Once again, the federal deposit insurance system served the public well by providing certainty to the citizens of the Gulf Coast with respect to the safety of their funds in their time of crisis. The region's banking industry will be dealing with the consequences of the storms for some time to come. In 2006, we will continue to work closely with affected banks and consumers to address those issues. The FDIC also continued to respond to the long term changes taking place in the banking industry, one that continues to consolidate and advance technologically. Conditions in the industry have never been better, but the broader changes underway have made our mission more challenging and important. We have prepared ourselves well for the challenges of the future in many areas. We continued working toward securing Congressional passage of deposit insurance reform. This legislation, signed by President Bush on February 8, 2006, combines the Bank Insurance Fund and Savings Association Insurance Fund and allows the FDIC to better price deposit insurance for risk. We devoted substantial resources to the interagency process for implementing the Basel II Accord in the United States. The FDIC's efforts highlighted the need to maintain existing U. S. Prompt Corrective Action standards under Basel II, and to find ways to address concerns identified by the fourth quantitative impact study (QIS-4). Our Center for Financial Research (CFR) co-sponsored two premier research conferences, both attracting over 100 prominent researchers and banking scholars from the United States and abroad. Also, 14 CFR working papers were published on topics such as risk-measurement and capital allocation regulations. Along with members of FFIEC–the Federal Reserve Board and the Office of the Comptroller of the Currency– we successfully implemented the Central Data Repository (CDR), a web-based system to collect, validate and manage quarterly Call Report data. The CDR employs a new flexible data standard–XBRL (eXtensible Business Reporting Language)–enabling Call Report data to be shared more easily and compared more readily with other financial data. As part of our continuing effort to improve our response to a potential large-bank failure, we sought comments on the best way to enhance the deposit insurance determination process. Given the increasing concentration of banking assets in a small number of the largest federally - insured institutions, we identified this as a major priority. We are conducting a thorough review of our policies, systems capabilities, interagency communication procedures and workforce readiness to ensure that we are better prepared to properly manage the failure of a large bank or thrift. We implemented our new Relationship Manager Program nationwide for all FDICsupervised institutions. Designed to strengthen communication between bankers and the FDIC, this program will enhance efficiency and increase flexibility in conducting examination activities. We established the new Anti-Money Laundering and Financial Crimes Branch within our Division of Supervision and Consumer Protection to better focus attention on increasing responsibilities in these areas. This Branch will address issues related to the Bank Secrecy Act, compliance, money laundering, financial crimes, terrorist financing and cyber-fraud. We continued to be a leader in helping banks to combat identity theft. The publication of our study, Putting an End to Account-Hijacking and Identity Theft, and a Study Supplement led to the issuance of FFIEC guidance in October 2005 requiring financial institutions to use stronger customer authentication techniques for Internet banking by year-end 2006. We also sponsored four identity theft symposiums around the country to educate the public and raise awareness about account hijacking and identity theft. We conducted a summer- long media campaign to raise awareness of the importance of financial education in Hispanic communities across the nation using the FDIC's free Money Smart financial education program. As the foregoing accomplishments illustrate, the FDIC continued to serve the deposit insurance system and the public well. In no case was this truer than for the citizens of the Gulf Coast who were able to rely on the guarantee of federal deposit insurance despite the uncertainties they were facing on other fronts. It is a testament to the strength and effectiveness of the system created over 70 years ago. For me personally, it is an honor to serve as Acting Chairman until a permanent successor is named.